I’ve got one more last-minute project you can make for a quick Mother’s Day gift. When my grandmother passed away, my sister and I were given a bunch of her old costume jewelry. We’ve saved it knowing we’d use it someday; but I wanted to do something extra special with it because I have a lot of fond memories of dressing up in that jewelry as a kid. For this colorful necklace, I paired some beads from my grandma’s jewelry with some new charms I made with my kids’ fingerprints. Now grab the heat embossing tool, the blank charms, embossing powder and watermark ink. Holler for your kids to come help. Have them smoosh a finger into the ink pad, blot it once on some scrap paper, then put their fingerprint onto the blank charm. Pour out a small pile of embossing powder onto some scratch paper, and gently dip the stamped side down into the powder. Tap off the excess powder, and set aside. Take care not to touch the powder on the charm, so the fingerprint stays in tact. Now repeat these steps for each kid or charm you’d like to make. Once your charms are fingerprinted, use the heat tool to melt the powder. Don’t pick them up yet…they’ll be really hot! While you’re waiting for them to cool, grab your jewelry-making supplies, and start planning your necklace. You could do just a simple charm on a chain, without the beads for a more understated look. But if you have some of Grandma’s old jewelry laying around, now is the time to put it to use! 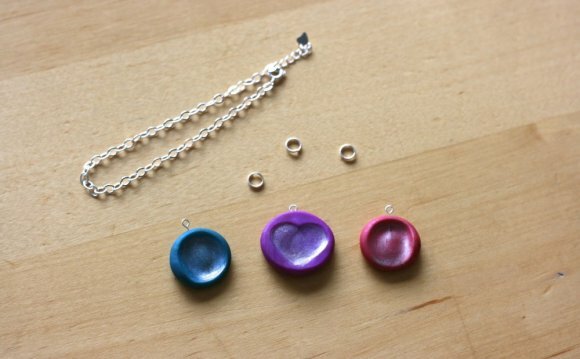 Use a combination of large and small beads, and alternate them with the fingerprint charms. Now, just attach them all to the chain and you’re in business. This is one Mother’s Day gift that is both sentimental and stylish; and I’m bet she’ll wear this new necklace with pride. *This 20% off discount is valid April 21, 2015 through May 10, 2015 and is good toward purchases of regular price and sale items at our stores or online. Discount will become void at 11:59 p.m. on May 10, 2015. Discount may not be used in combination with other discount codes. Discount is not applicable toward past purchases, returned merchandise, special orders, floor samples, Gift Cards, eGift Cards, workshops or employee purchases. Discount is also not applicable toward purchases of third party custom orders (Vera Wang, William Arthur, Elum, Checkerboard). Discount applies to merchandise only and cannot be applied toward shipping and handling charges, taxes or fees. Offer has no cash value, is nontransferable and may not be auctioned or sold. No cash/credit back. Paper Source reserves the right to modify or discontinue this offer at any time. Void where prohibited by law.